south to north which makes navigating the streets easy. If you are traveling uphill, you're going south. There is also a small mountain range bordering the city to the east. Much more European than I had expected. Definitely feels less adventuresome than the rest of Central Asia... but a good place to kick back and indulge in familiar things from home. Nice parks, Soviet-style monuments, cafes and mountain views. After living in Almaty for three years, I can honestly say there is no place like it. The mix of Russian and Kazakh culture provides both a western and eastern experience, and the surrounding landscape is absolutely beautiful. Head up to Chimbuluk in the winter for skiing and snowboarding, check out Gorky park for some old-fashioned amusement rides, and sample some of Kazakhstan's unique dishes - plof and shashlik are a personal favorite. Former capital of Soviet Kazakhstan, home of famed Modeo winter sports complex, crossroads of cultures (and religions) and my home for a year, Almaty may no longer be the heart of KAZ, but it remains the soul. 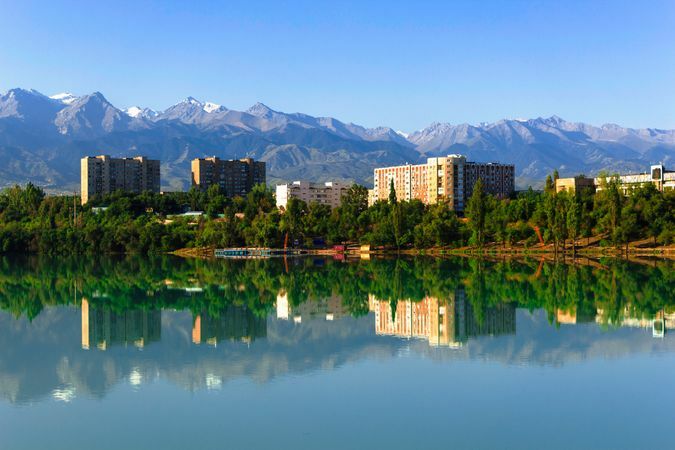 The streets are wide and lined with trees, the Tien Shan mountains loom over the city and the climate mimics Utah with sun in the city and snow in the mountains year-round. There is plenty of history and culture here and easy plane, train and bus access to the famed Silk Road and Great Game cities of Central Asia to the south.